Some organic gardening methods, including biodynamic and bio-intensive gardening, encourage the gardener to grow crops specifically for the compost pile. While very devoted adherents to these types of methods might use more than half of their available gardening space to grow compost crops, you don’t have to go that far. The good news is that you can grow plants specifically for your compost pile that, in some cases, will feed your family or local wildlife as well. 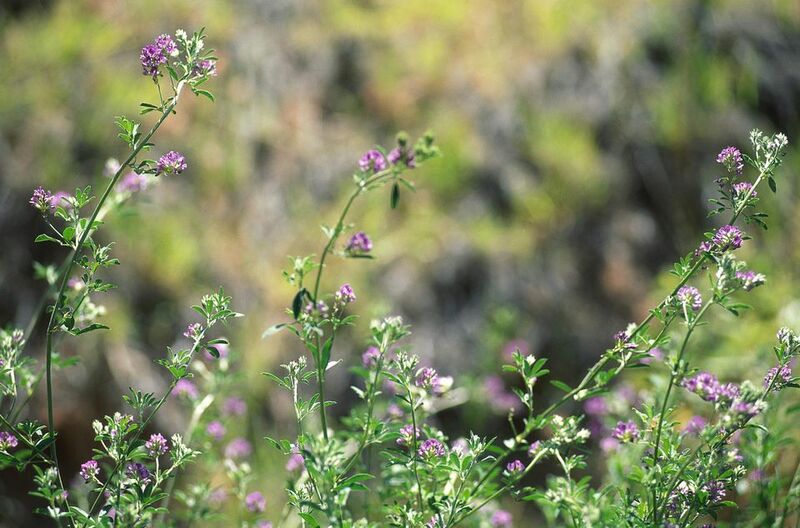 A very simple way to grow plants for your compost pile is to grow alfalfa or red clover. Both of these plants can be tucked between rows or planted at the edges of your beds. When the plant gets tall (according to your tastes), just shear it back and toss the clippings in the compost pile; it will continue growing. The best way to shear it back is to use some grass shears or clippers, collect the clippings, and compost them. A mower could work, but if you have the plant in your vegetable garden, that’s not really a viable solution. If you have some spare room, consider growing biennial yellow clover near your garden beds. The roots will fix nitrogen in the soil, and you can toss the top growth into the compost pile for extra nitrogen. You can usually harvest yellow clover at least twice during its biennial growth period. This works better in an out-of-the-way area (not interplanted with vegetables or used in paths) because it tends to grow fairly tall and it could shade out your other plants. For garden beds that are in production during the growing season, consider planting winter rye a cover crop when you’ve finished harvesting for the year. Annual cover crops such as winter rye help add nutrients to the soil and also protect the soil from harsh winter weather. You can either mow it and put the clippings into the compost pile in the spring or till the soil well before planting. Another group of plants you might want to consider is the brassicas, also known as “forage brassicas.” Thee include daikon radish and kale. You’d seed them more heavily than you would for traditional vegetable gardening, but you can still harvest plenty of kale leaves, plus have plenty of stalks and stems for the compost pile and strong roots to help feed and aerate your garden soil. You can find seeds in bulk at farm supply stores and from some seed vendors. For another crop that supplies both your table and your compost pile, consider edible beans such as red cowpeas or black-eyed peas. Simply grow them as you would any other bean, harvest when ready, then cut the vines down and add them to your compost pile, leaving the nitrogen-fixing roots in place in your garden bed. Soybeans (or edamame) can also be grown, harvested, and used this way. There are two herbs you may want to consider growing for composting, borage and comfrey; they accumulate zinc and phosphorous and grow rapidly, producing plenty of organic matter for your compost pile. In addition, you can use both as you would any herb, and, if they bloom, they’ll provide food for bees and butterflies. All of these are excellent choices for compost crops. If you don’t have a ton of space, you can likely still tuck in a few here and there; every little bit helps! Of course, if you don’t have the room for any of these crops, you can still make perfect compost with kitchen scraps, grass clippings, and fall leaves.